Eyeliners are one of the most important items of a vanity box. Even the girls who are not much into makeup, do use eyeliners. Eyeliners are my favourite out of all the makeup products because ever since I was a teen, I have been using those like everyday. 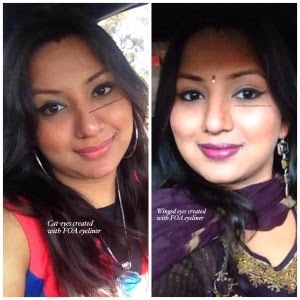 My everyday makeup look used to include a moisturiser, a compact, a lip balm and an eyeliner and I used to be all set and glammed up for pretty much every occasion. I have tried almost all kinds of eyeliners ranging from pencil to liquid and gel eyeliners in colours like black, brown, green, blue, gold, copper, silver etc. By now you might have concluded that I am crazy for eyeliners. However my all time favourite eyeliner has always been liquid black eyeliner because you just can't go wrong with that and considering the number of looks you can achieve with this multitasking product make me even more obsessed about it. I got this eyeliner in my vanity box which was gifted to me on the occasion of my engagement, by my cupcake and it's been more than 3 years since I have been using it like everyday. Availability: Easily available at KMart, Priceline, Big W, Target in Australia. Ingredients: Not mentioned on the packaging. Packaging: The packaging looks like that of a high end eyeliner because of its matt black surface with the brand name written in white colour. It's a very sleek looking bottle made up of very high quality plastic which is flat with rounded edges and has a very secure elongated cap which has the applicator brush enclosed within the bottle. It is easy to carry this eyeliner in a clutch also so it is very travel-friendly. It is easy to open it up because of its matt surface which allows a good grip and you never have to use your teeth or some piece of cloth to open it up. 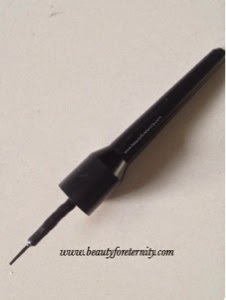 Applicator Brush: FOA liquid eyeliner comes with a long and slender cap which has appropriate length so it's quite easy to hold and use it to apply the eyeliner. It neither slips nor makes your hand shaky so that you can always apply it like a pro. The applicator brush is the best out of all the liquid eyeliners which I have used till date. 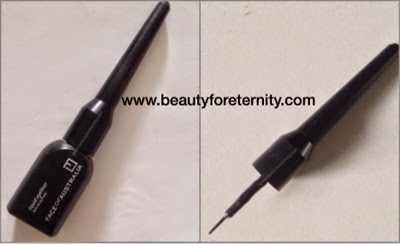 It is long, flexible and very easy to control from going to places because the bristles stay together and gives you a very even and clean finish every-time you apply eyeliner. I can create thinnest and thickest lines by using this brush. It also holds just the right amount of product which is enough for eyeliner application on one eye. It goes on very smoothly on my eyes and works like a dream. My detailed opinion about the Eyeliner: This liquid black eyeliner from 'Face of Australia' is a coal-black, 100% opaque eyeliner which applies wet but quickly dries to a matt finish. It does not form flakes and streaks and goes on very smoothly over the eyelids. It takes only 3-5 seconds to fully dry. However if you apply two coats then you might need another 3-4 seconds. It is 0% allergic and has never caused any itchiness, allergy, redness or burning sensation to my hyper-sensitive eyes. I have even slept with it on my eyes for entire night and had no issues. It never makes my eyes watery. I have used it with as well as without contact lens. I find it really easy to create a cat eye and winged-eyeliner look by using this eyeliner. 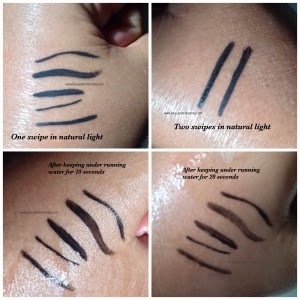 If you are a novice or beginner to using eyeliners and have a shaky hand while applying eyeliners then you must give it a try. 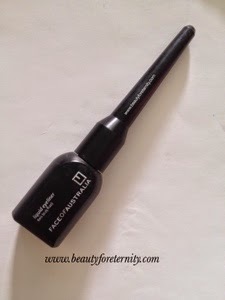 Wear-time: This liquid eyeliner from FOA has a great wear-time because it stays intact on my oily eye-lids for 4-5 hours without using a primer. If I use a primer underneath this eyeliner then it lasts even longer for up to 6-8hours before it starts to fade away.I never feel like rubbing my eyes when I have this eyeliner on so it stays as it is. However if you have a habit of rubbing your eyes then you might need to do some touch ups to make it stay long. 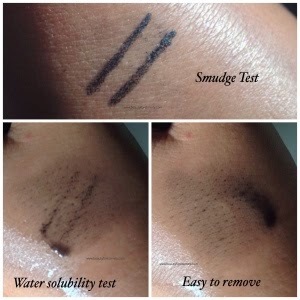 Water-Resistance: This liquid eyeliner is not water proof. However it is definitely water-resistant. I kept my swatched hand under running tap-water for 10 seconds and this was the result. After another 10 seconds it started to fade away. Smudge-Proof: This eyeliner is quite smudge proof. I tried to smudge it by rubbing with my fingers quite vigorously after it was fully dried and this was the result. How to remove: Being water based this liquid eyeliner comes off easily with just one swipe of a wet cotton ball. It is very easy to remove this eyeliner from your eyes. It does not make my eyes stained even if I remove it with just plain water. I really don't have any issues with this eyeliner. However I would like it to be water-proof and not only water-resistant because the weather in Melbourne is unpredictable and you never know when it starts to rain. And none would like her eyeliner to be washed away with rain water. Summary: This is a very affordable, matt, jet-black eyeliner which has a quick drying formula , applies on really smooth, stays smudge-proof for a long time and is water resistant. This is ideal to create winged eyes and cat eyes. This definitely gets a 'Go for it'. If you haven't tried this eyeliner then you have not probably had the best experience of using the eyeliners. Everyone must give it a try. Here are the two looks which I have created with this eyeliner. Which one is your favourite eyeliner ? Do share with me in the comments below.